Villa Kalithea sits on the hillside set in tranquil vistas of olive trees and Mediterranean wildflowers. 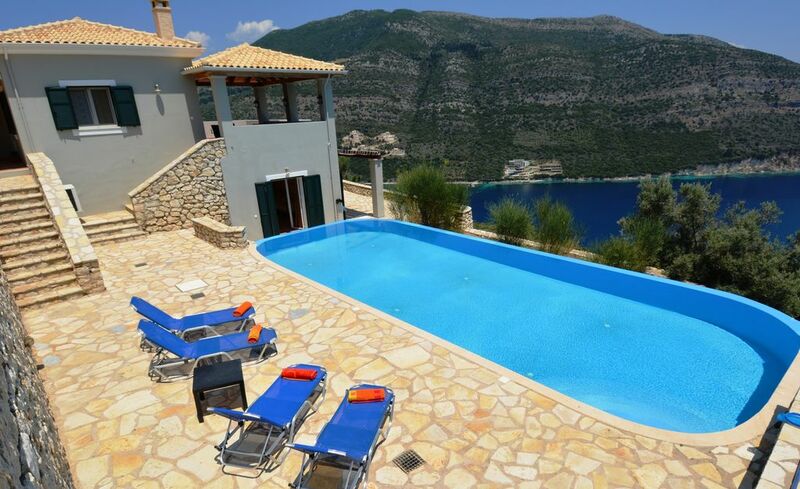 Villa Kalithea is a modern coastal villa within walking distance of Mikros Gialos (also known as Poros) beach, several lovely tavernas and restaurants, cafés and a useful mini market. This exquisite south-east facing villa is perched on the hillside and built in such a way to ensure that wherever you sit you can enjoy gorgeous panoramic sea views out and across the vivid blue Ionian Sea and to the beautiful bay and beach of Mikros Gialos. Villa Kalithea is completely private and not overlooked and at the same time it is close to all amenities. The sun shines on the villa from dawn until dusk and if you prefer there are plenty of shaded areas around the villa for total tranquility and relaxation. The villa is about 20 mins walk from the unspoilt bay of Mikros Gialos and 15 mins drive from Nidri to the north and Vasiliki in the south. The villa is stylishly furnished with all the mod cons you would need to enjoy a relaxing and comfortable holiday. Set alone, the villa is approached through wrought iron gates down a winding stone walled private drive with private parking at the entrance of the property. Upon entering, villa Kalithea opens into a large and spacious lounge/dining room with large French windows leading out onto a shaded verandah with comfortable seating for you to sit back, relax and enjoy the uninterrupted sea views. The kitchen at this comfortable villa, also on this level, is fitted in cherry wood with granite tops and includes fridge, freezer, electric hob and full oven with extractor, microwave, dishwasher, double sink, all utensils, crockery, cutlery and glasses provided the kitchen has triple aspect with stunning views. A staircase with hand rail leads to the lower level where the two spacious bedrooms with en-suite bathrooms are. The Master bedroom with two large French windows leading out to the swimming pool and the Twin bedroom with window and large French window leading out to the terrace at the front of the villa both bedrooms have outdoor seating from where you can enjoy the gorgeous views across the olive groves. There is also a utility room on the lower level with a washing machine, ironing board and iron plus clothes airer. Villa Kalithea is air conditioned throughout and has insect nets on all windows and doors. The 10m X 5m infinity swimming pool can be accessed from both levels and has sun chairs with outside hot and cold shower, walk in steps at one end of the pool take you to an approximate uniform depth of 2m. There are several paved areas around the villa including a covered terrace close to the kitchen which was purpose built for the all essential summer outdoor dining with a hand built Clome oven and barbecue plus a small herb garden. Mikros Gialos locally known as Rouda Bay has several excellent tavernas and fish restaurants. There are a handful of cafes plus a well stocked mini-market which also brings fresh bread each morning. You can reach Mikros Gialos on foot from villa Kalithea within about 20 mins and it is uphill some of the way back so perfect if you are going out for an evening meal but beware in the heat of the hot afternoons! The bay is perfect for swimming and snorkelling as the water is crystal clear and there are plenty of rocky areas at the sides where you may be lucky to see starfish, hermit crabs, sea cucumbers or even an octopus! En-suite bathrooms to each bedroom includes walk in power shower, WC, basin mirror and shaver point and vanity units, hair dryer. Lounge includes 3 seater sofa, 2 arm chairs and coffee table, T.V. DVD small book cabinet with CD and Radio system, Greek curved open fireplace, fully air-conditioned. Outdoor dining table and chairs on covered terrace by barbecue. Large south-east facing 12mX5m infinity pool which has walk in steps, approx uniform depth 2m, sunloungers around pool, hot and cold outside shower. We have surfaced the road up to villa Kalithea so it is now easy to drive to the villa in any type of car. We are so glad that you enjoyed your vacation in our villa and we’re able to appreciate those magestic stunning views across the bay from all those seating areas. We never tire of just sitting on the veranda with a coffee looking across and watching the yachts and small boats. Thank you for taking the time to send your review. Most wonderful relaxing holiday ever! This was our second visit to Villa Kallithea. Usually we never go back to a villa, but we were so pleased to return to Kallithea. It's a perfect location, only about an hour from the airport and really secluded and private, but only about 7 minutes' drive to several great tavernas. We spent every day in & around the huge pool, enjoying the wonderful view of the bay. It's so quiet in the villa that after a couple of days we all looked up when we heard a car - only to realise it was about half a mile away! The road is much better now & you don't need a jeep to get to the villa. The facilities in the villa are great - plenty of space, well equipped kitchen & wonderful showers. The beds are great & the sitting space outside is lovely & so relaxing. Thanks Lilias for organising a car from Broumis (who were also really helpful) & a also a boat for a day from Nidri. We ate at all the local restaurants & they each have their own character, but they're all friendly with great food. We didn't have a single bad meal & we would happily go back to them all. Very happy - thanks very much Peter & Lilias! Thank you for you very prompt and complimentary review, it is not only a great advert but help other holidaymakers choose their perfect holiday but more than that it makes all the time effort and money we have invested in the villa seem so worthwhile, this last year I have not been very well and Lilias has had to do so much more and this review rewards her efforts. So thank you again we are delighted you had a great time and hope you can visit us at Kalithea again. We had a genuinely fantastic stay at Villa Kallithea. The views and the setting are stunning, and the property has been cleverly designed to maximise the beauty of the location.The generous pool area affords fantastic views across the bay from dawn til dusk, and then there is the tasteful outdoor dining area to enjoy evening meals and barbecues with the same stunning backdrop. The website photos do not do justice to the beauty of the place. We had a fantastic holiday - from enjoying the generous welcome pack on arrival, to the understanding approach on our last day. Lilias's team were fantastic, with unexpected cleaning and bedding changes, being very responsive to any queries or problems we had, and providing great ideas to tailor our holiday with things we wanted to do. In fact, the help started way before we reached Lefkas, with advice on car hire, boat hire and restaurant bookings for a special occasion. Thank you for your positive review, we are very proud of the villa and our team who work very hard for our clients, we try and provide the sort of holidays we enjoy ourselves, we can’t compete with the big companies so offer the special touches and a high quality holiday venue. We wanted a villa that was private and secluded and this fitted the bill. Once you get over the drive up the hill the views from the villa are stunning. Everything about the villa was perfect, from the pool to the barbeque area. Plenty of space to get in /out of the sun and very quiet. We had never been to Lefkada before but would love to go again. We are a family of four and stayed for 2 weeks at this wonderful villa. The views from every terrace and all rooms was just breath taking, the villa was beautifully kept and Paris who was so helpful and friendly kept the villa in beautiful condition. The pool was where we spent most of our time, is was a really good sized pool and to look out onto those amazing views while cooling off was fantastic, my children were in the pool day and night. The beach in the village was lovely to. Lilias was fantastic, from booking the villa, boat hire, car hire and recommendations, nothing was too much bother for her. Great to hear you such a good time sounds like you all earned it, thank you for taking the time and trouble to write a review we are very proud of the villa and our team and such reviews make it so worthwhile, your picture at the pool was amazing, delighted the holiday went so well, we would love for you to stay with us in the Future and Lilias is always on hand to help and recommendations are very welcome, thanks again enjoy the rest of the Year. This property is wonderful , this is our 2nd stay here and is worth it for the peace and tranquility. Lilias and her team are excellent and nothing is too much trouble. The tavernas in the village are excellent very very friendly and really welcoming especially Delmar owned by Kristoffand his friendly staff. The beach and the sea are very calm so great for swimming and having the tavernas on the back of the beach is great and very convenient for eating lunch times with an ice cream shop too. There is also a small run family supermarket which stock everything you need as well as the large supermarket 10mins away on the way to micros gialos.please visit porous this was tsuch a find a typical Greek village with two tavernas. This is on the road that forks off to the left as you head to mikros gialos. We had a fab meal in one on them with fantastic views free pudding and free ouzo and a free fridge magnet!! There were only four tables but it was fabulous! We hope to come back again as there is everything here for a peaceful tranquil holiday. Thank you for your kind Review I am so pleased you enjoyed your second stay with us, we try to improve the Villa each year this year we refurbished the road and improved the Garden planting, it is a very special place and we are delighted to share it with like minded people. Lefkas Town, 30 mins drive, is the main commercial centre. There is a quayside road south of the causeway entrance with a busy marina. The High Street runs through the centre of town and is also known as the ‘Pazari’, this is the main street for shopping and cafes. A mid-morning coffee in the square is ideal for a break and a perfect opportunity to see the Lefkadians in ‘action’! The architecture has been mainly influenced by the Venetians and the post Byzantine traditions but also by the Turkish and the English. The houses in the main part of the town are two storey buildings, very closely packed, without yards or gardens and with narrow alleyways running between them. It is lovely to walk around the back streets of the town where you are also more likely to see the typical Lefkadian houses wrapped in brightly painted corrugated iron. Geni, 15 mins drive, is a pretty little coastal village on the east coast with an abundance of great fish tavernas located on the water's edge. Nidri, 15 mins drive, is the primary holiday resort on Lefkas. There are a variety of tavernas, restaurants and cafes here, also a handful of bars and a couple of nightclubs. The majority of shopping and tourist facilities are on the main street. On the seafront, known as the ‘Paralia’, you can enjoy a wonderful view of the Pringiponissa islands - amongst which is Scorpios, owned by the Onassis family. Ag. Nikitas, 40 mins drive, on the north-west tip of the island, is a pretty little village surrounded by fabulous beaches such as Pefkoulia, Kathisma and Kalamitsi. The nucleus of the village has been placed under preservation order, thus maintaining the traditional Ionian ambience. Syvota Bay, 10 mins drive, is in the south-east at the head of a large bay and has an outstanding natural harbour. Syvota is wonderful for an evening meal with great fish tavernas by the sea. Vassiliki, 10 mins drive, in the south is a self-contained tourist resort with a full range of facilities. The harbour is lined with restaurants and cafés and the main street has a fair number of shops. Many sailing companies operate from here and you may hire windsurf boards on a daily or hourly basis. Vassiliki has a ferry port operating a service to Cephalonia and Ithaca. (15 mins drive) A long sandy beach dotted with restaurants and hotels on the outskirts of the town. Very good for children as it is very shallow for a relatively long way in and does not shelve steeply. There are water-sports facilities including paragliding, wakeboarding, water skiing and fun rides. (approx. 1 hr drive). One of the most beautiful beaches on Lefkas. Fine shingle dotted with rock formations and a long stretch of pure white beach. There are two small cafés and not much with regards to sun beds and beach facilities. (approx. 40mins drive) Porto Katsiki, the best known beach, is today considered one of the most outstanding in the whole of Europe. This is a beach of exceptional beauty at the most southern tip of the island. A gorgeous shingle beach framed by high limestone cliffs and crystal-clear turquoise water. There are cafes and tavernas at the beach and sunbed facilities on the beach. (approx. 40mins drive). 296 or so, steps lead down to this stunning beach virginal fine shingle beach. One of the top beaches in the Ionian Sea this is a must for visitors to Lefkas island. As with Porto Katsiki it is a gorgeous beach framed by high limestone cliffs and crystal-clear turquoise water. Motorboat hire is a must as it can open up a realm of uninhabited beaches and coves. The motorboat includes the provision of a map of the boating area, buoyancy aids, flares, oars and anchors. Detailed instructions will also be given for operation and mooring and a full local back-up service is provided. There are many small deserted coves on the coast and excellent snorkelling areas where you can enjoy the local marine life such as Sea Urchins, Sea cucumbers, Red Star Fish and when overturning stones or rocks perhaps you may find Brittle Starfish or even Octopus! Detailed driving instructions to the villa will be provided at time of booking.